Yesterday we revealed that Gareth Edwards has confirmed that Godzilla will be 350ft tall in the new Legendary release of Godzilla 2014. Read the quote from "Empire Magazine" below. He also revealed that it's the biggest Godzilla to hit the big screen. "Technically he's 350ft in our film." He also noted that they experimented with different sizes, making him small, huge, and dinosaur size. But then they realized that 350ft made him the biggest of all the Godzillas "So we said, 'let's do that.'" 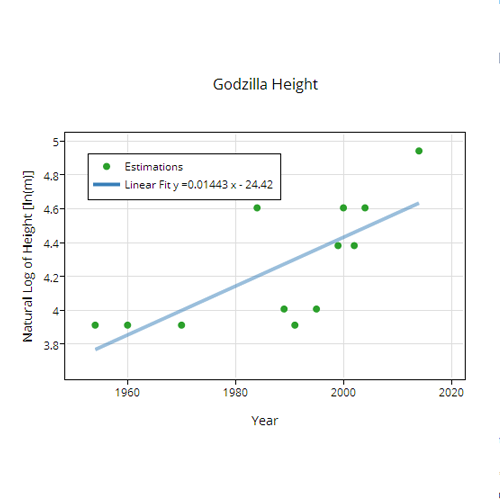 The larger Godzilla actually follows a 30-year trend among the 27+ Godzilla movies. In fact, "Wired Magazine" actually figured out what the mathematical formula is for this trend. These are mostly guesses for the years. I could have looked up the actual movie dates, but I’m too lazy. So, this is just an approximation of Godzilla’s size not the size of the actual and REAL Godzilla. Actually, I plotted the natural log of height as a function of time. Why? Well, this is a more generic plot that I can then add a linear function to. 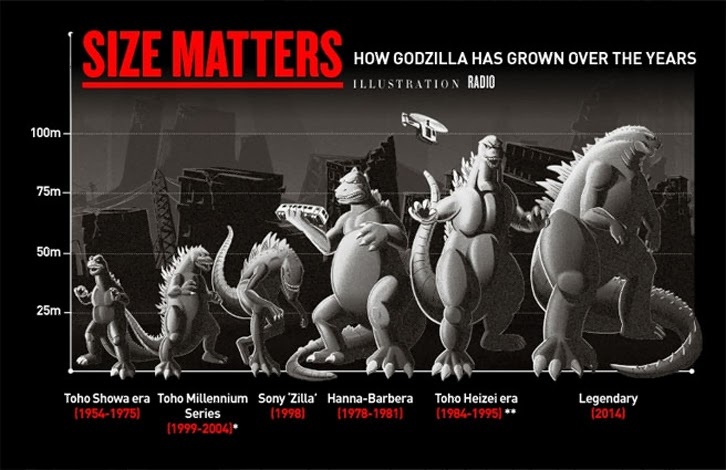 Otherwise, I am assuming that Godzilla grows linearly with time. Why would anyone think that? And yes, I cheated. You can’t take the natural log of “50 meters”. Really this is the natural log of the height per meter (so that the stuff inside has no units). Now, when I fit a linear function to this data I get the following (where a and b are the fit parameters from plotly). That is 121.6 meters but I left off the meters because of my mathematical cheat above. Yes, that’s not so big. The reason is that although the 2014 Godzilla is 140 meters, this is bigger than the other trend. Really, it’s too big. A better value would be around 100 meters (this is based on the fit that includes the 140 m height though). 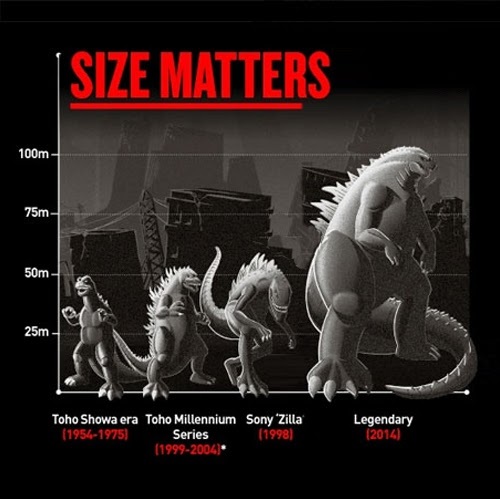 SRC: Wired Magazine, "Godzilla Gets Bigger Each Year"
its wrong the chart because the final wars Godzilla (2004) was 100 meters feet tall too and the 1985 and 1989 were both 80 meters so the chart is sort of wrong but not by a lot, but I still think its cool having a sort of good size chart.